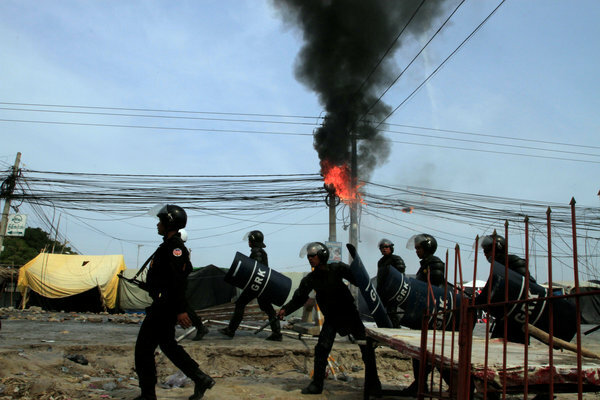 PHNOM PENH, Cambodia — Seeking to quash one of the most serious challenges to the nearly 30-year rule of the country’s authoritarian leader, Cambodian authorities evicted antigovernment protesters on Saturday from a public square and banned all public gatherings as a court summoned two opposition leaders for police questioning. After months of inaction in the face of growing public dissent to his rule, Prime Minister Hun Sen appeared to signal that he was entering a more aggressive posture toward his critics. 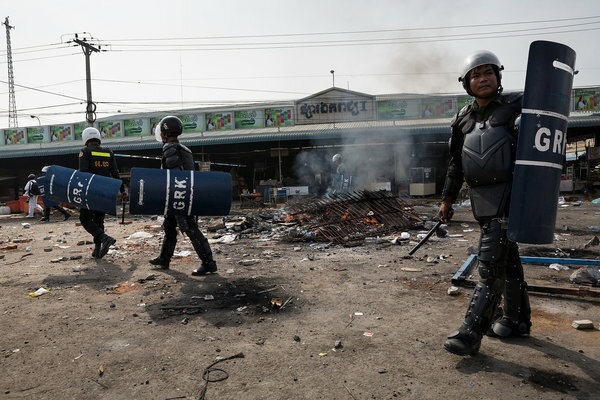 The crackdown came after a clash on Friday between protesting garment workers and the Cambodian police that left four of the demonstrators dead. The workers have been at the forefront of growing protests against Mr. Hun Sen’s government. Mr. Hun Sen’s party claimed victory in July elections, which the opposition and independent observers say were riddled with irregularities. Since then, the opposition has called for him to step down. 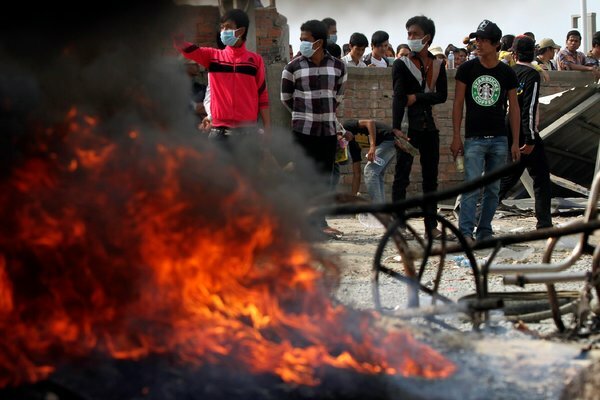 In a country with a history of violence against opposition figures, the two opposition leaders wanted for questioning, Sam Rainsy and Kem Sokha, appeared to go into hiding. “They are in a safe place,” said Mu Sochua, an opposition politician who was elected as a lawmaker in July but has boycotted Parliament along with the rest of the opposition. Last weekend, the opposition staged a protest march of tens of thousands of people through the streets of Phnom Penh, an act of defiance on a scale rarely seen during Mr. Hun Sen’s more than 28 years in power. After the crackdown Saturday, the opposition announced it was canceling a march planned for Sunday. 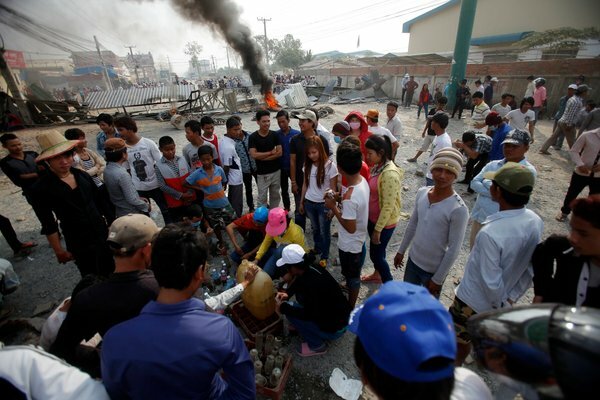 In a statement, the opposition Cambodia National Rescue Party urged its followers to remain calm “while the party seeks alternative ways” to continue its campaign against Mr. Hun Sen’s government. Many parts of Phnom Penh were unaffected by the crackdown, including the main tourist area along the Mekong River. But elsewhere, hundreds of police officers and soldiers blocked roads, broke up crowds of bystanders and cordoned off the public square, known as Freedom Park, where the protesters had been gathering. The dispersal of demonstrators from Freedom Park by the police and others was highly symbolic. In 2009 the government officially designated the square as a place where Cambodians could express themselves freely, roughly modeling it on Speakers’ Corner in London. The square has been the center of protests led by the opposition since the elections in July. Protesters who have camped out there since mid-December have included Buddhist monks, elderly farmers and human rights advocates. 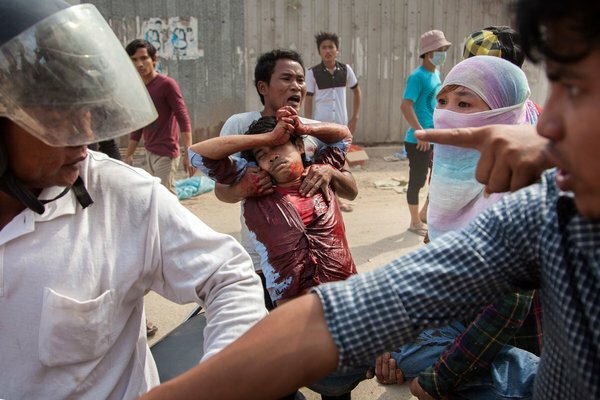 The Cambodian Center for Human Rights, an independent advocacy organization, accused the government on Saturday of a “violent clampdown on human rights” and said protesters were chased out of the square by “thugs dressed in civilian clothes” who were armed with steel poles and other makeshift weapons, an observation corroborated by journalists who were present. 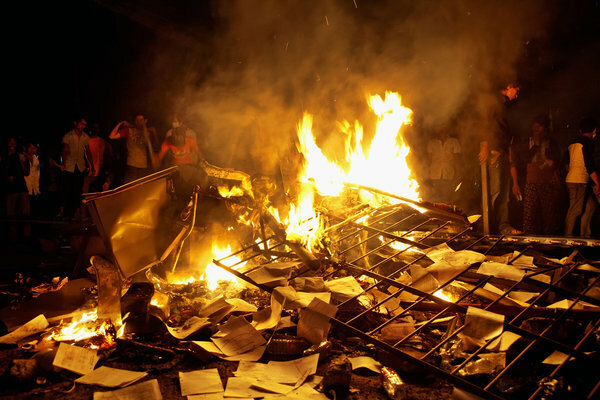 A number of protests during Mr. Hun Sen’s time in power have been broken up by shadowy groups. 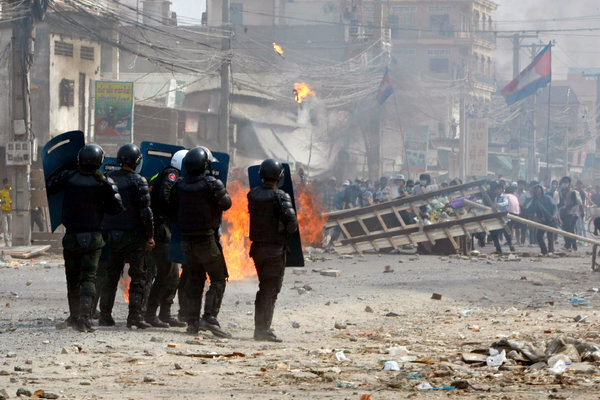 In 1997, a grenade attack on a protest led by Mr. Sam Rainsy left at least 16 people dead. 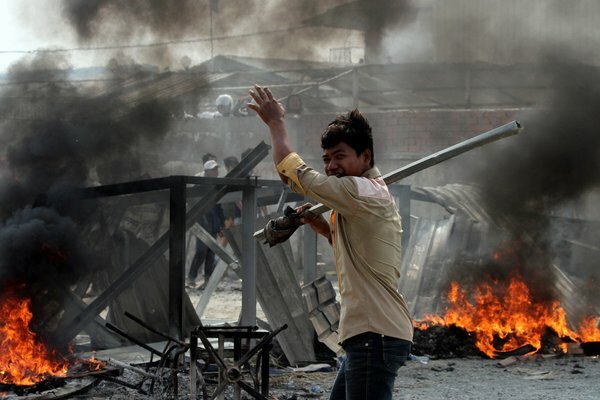 On Saturday, Cambodia’s Ministry of Interior issued a statement saying that the eviction of protesters “was conducted in a peaceful manner without any casualties.” Recent protests, the statement said, “led to violence, the blocking of public roads and the destruction of public and private property,” an apparent reference to the clashes between garment workers and soldiers on Friday, among other recent episodes. Mr. Hun Sen has been credited with stabilizing the country after the brutality of the Khmer Rouge, whose genocidal policies led to the deaths of 1.7 million Cambodians. But in recent years he has accumulated highly centralized power, including a praetorian guard that appears to rival the capabilities of the country’s regular military units. Economic growth that has brought modernity and prosperity to Phnom Penh has exposed stark inequalities in the country, where well over a third of children are malnourished. Only one-quarter of the Cambodian population has access to electricity. The streets of Phnom Penh are shared by luxury cars and families of four squeezed onto dilapidated motorcycles. Garment workers, who number in the hundreds of thousands, have been the most aggressive in seeking higher wages. Striking workers are demanding a doubling of the monthly minimum wage to $160 from $80, an increase that the industry says will make it uncompetitive. 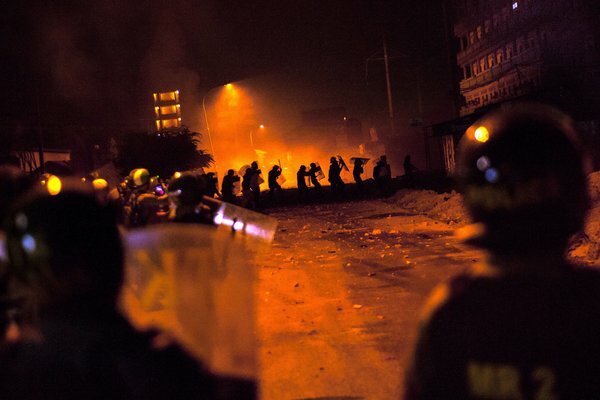 In the clash on Friday, garment workers confronted officers with rocks, sticks and homemade firebombs. The police fired into the crowd with assault rifles, witnesses said. 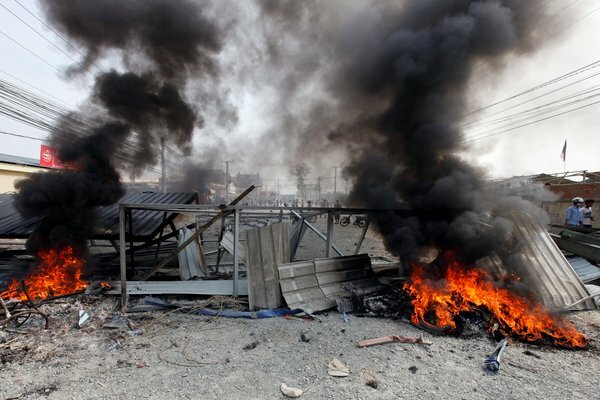 In addition to the protesters killed, at least 20 people were injured. 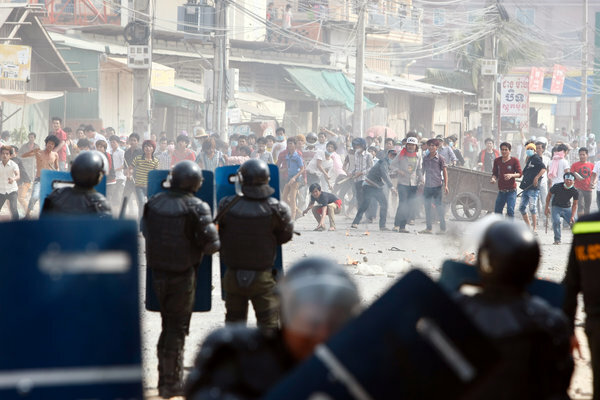 A version of this article appears in print on January 5, 2014, on page A9 of the New York edition with the headline: Cambodia Cracks Down on Protest With Evictions and Ban on Assembly.